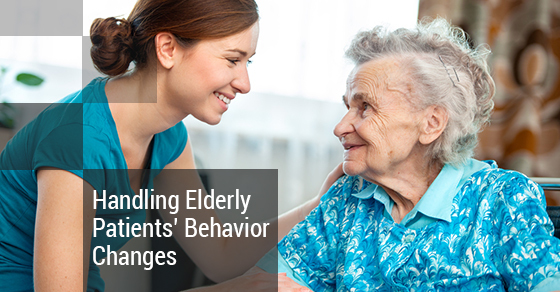 While it can be very rewarding to assist elderly patients with normal everyday activities that they can no longer do independently, you need to be prepared for possible behavior changes among this demographic. The reason for this is that elderly patients who are usually soft-spoken, friendly and appreciative can sometimes exhibit a profound personality change due to a whole range of reasons – many of which have nothing to do with you. Yet, you’ll have to learn to deal with these fluctuations. Fortunately, there are things you can do to make it easier to deal with the mood swings of elderly patients,what follows are some caregiver tips on how to handle behavior changes of elderly patients. If your elderly patients uncharacteristically express feelings of anger, there are things you can do to get through such situations. First, you should attempt to find out why they are angry. Their anger issues could stem from a whole host of things ranging from coping with chronic pain to dealing with the embarrassment of incontinence to having difficulty accepting the loss of their independence. Also consider the possibility that there may be some underlying mental health issue such as dementia or Alzheimer’s disease. In the event that you suspect that mental health issues are at play, be sure to report it the elderly patients’ doctor. This will give you a better understanding as to why they’re having these issues, and will give you a clear direction on how you can help. If your elderly patients go from using clean language to using foul language, you have the right to be alarmed. Issues such as dementia or Alzheimer’s disease cannot be ruled out since out-of-character behavior is a telltale sign that one of those illnesses – or maybe something else – may be a factor. When your elderly patients engage in bouts of swearing, try to change the subject to something else. This diversion technique just might be enough to get your elderly patients to forget about what had triggered their uncharacteristic behavior and get them to focus on something else instead. Abuse can take various forms such as physical, verbal, mental and emotional. Unfortunately, it is not uncommon for elderly patients to subject their caregivers to abuse. Often times, this acting out is just a way for them to vent their unhappiness about some of the negative things that come with aging. How do you address the matter? First, try to talk to your elderly patients if they’re being abusive. Have a professional evaluate them to see if there are any soothing methods you could exercise, and if this doesn’t work, talk to your staffing company. It’s more than likely that the company who set you up with your patient has had plenty of experience in this area and can suggest further actions for you to try. You’ll need to learn to properly deal with changes in the behavior of your elderly patients in order to avoid burnout – something that many caregivers have experienced over the years. Learn how to handle certain scenarios so that you can be the caregiver your elderly patients need, even if they don’t always seem to appreciate, or feel a need for, your care. Take a break when you need to, and relax when you can. Your job as a caregiver will demand a lot from you — emotionally, mentally and physically — and it’s absolutely normal for you to need to reboot and recharge.